Learn how to make an amazing Mexican style Sweet Potato Breakfast Tacos with a unique set of ingredients. Plus learn why you should use cream in eggs to create perfect, fluffy scrambled eggs. 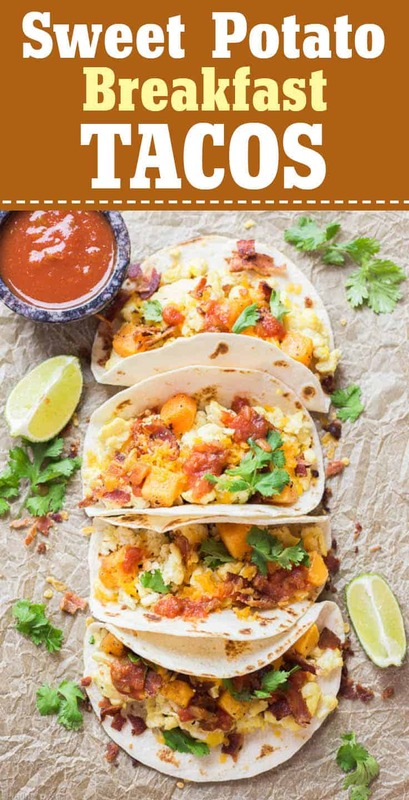 Fluffy scrambled eggs create a lush bed for crispy bacon pieces, roasted sweet potato cubes, melted cheese, picante sauce and fresh cilantro in these unique fall-themed breakfast tacos. Use mini flour tortillas and heat them up so they’re warm and soft before adding the taco filling. 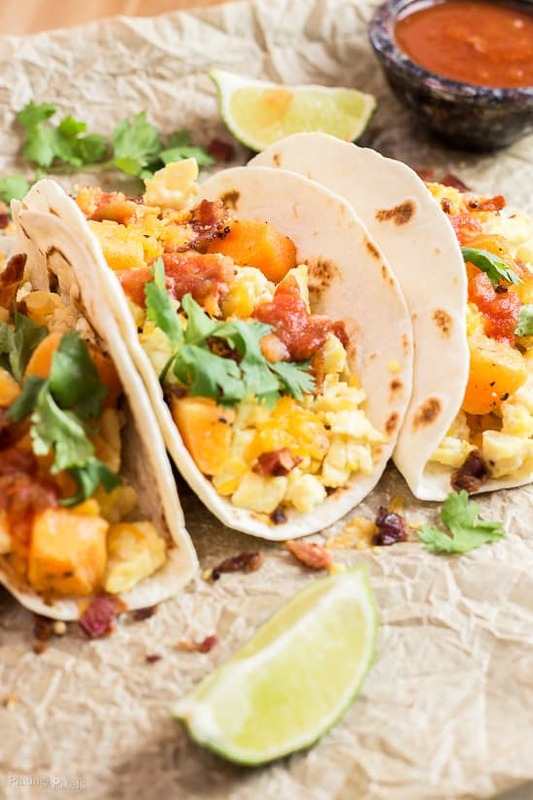 You could use corn tortillas (plus will make these breakfast tacos gluten-free) but they’re tougher and will give a different flavor. I find the flour tortillas are best for breakfast tacos. If you don’t have cheddar cheese you could try pepper or monterey jack, queso, manchego, gruyere or fontina. They’d all work really well! Adding half and half to scramble eggs make them light and fluffy. Can use crumbled cooked sausage or chorizo instead of bacon. Should I add cream to scrambled eggs? Yes, adding cream to scrambled eggs creates fluffy and airy eggs. The water in half and half boils and makes steam as it cooks, adding moisture and fluffing up the eggs. 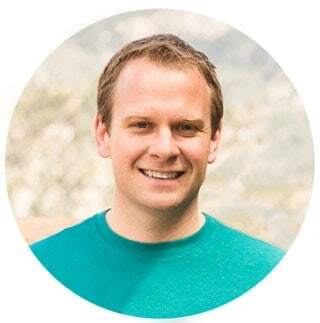 The fat in half and half coats the egg proteins that bond together while cooking; without this they bond together tighter and squeeze out extra moisture, creating tougher eggs. Milk, or even heavy cream, can be used as well; but half and half has the perfect ratio of water to cream. Flavor profiles: Savory, bacony, and cheesy with rich picante flavor. Texture: Fluffy eggs, crispy bacon, and soft sweet potatoes create a symphony of textures. Dietary Options/Substitutions: For vegetarian omit bacon. For gluten-free use corn tortillas. 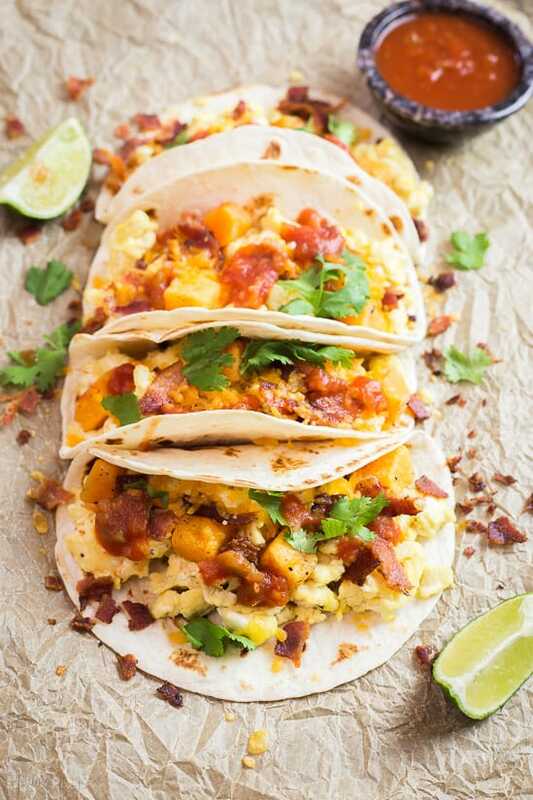 Scrambled eggs, bacon, roasted sweet potato cubes, cheese, picante sauce and fresh cilantro. 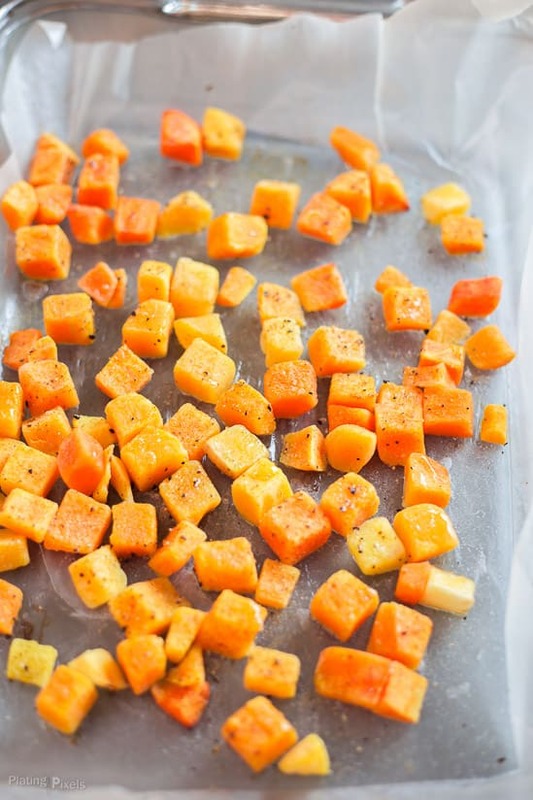 Pre-heat oven to 425º F. Toss sweet potato cubes with olive oil, ½ teaspoon salt and ½ teaspoon pepper. Place on a large baking sheet in a single layer and roast for 20–25 minutes, until browned and tender. Meanwhile: Cook bacon in a skillet or pan on medium-high until crispy; about 8 minutes, rotating half-way. Remove bacon and cut into small pieces. Drain oil from pan, reserving 1–2 tablespoons. In medium bowl whisk together eggs, remaining salt and pepper, half and half, and 1-tablespoon picante sauce. Heat leftover bacon grease in pan to medium heat. Add egg mixture, cook 4–5, stirring frequently until eggs are set and fluffy. Heat tortillas, then top each with scramble eggs, sweet potatoes and bacon pieces. Sprinkle cheddar cheese on top and garnish with salsa, fresh cilantro and squeezed lime juice. Use mini flour tortillas and heat them up so they're warm and soft before adding the taco filling. You could use corn tortillas but they're much tougher and will give a different flavor. I find the flour tortillas are best for a breakfast recipe. Feel free to add extra chili and spices for extra heat. 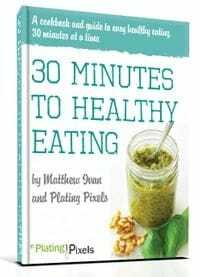 You could top with hot sauce or add fresh or dried chili to the salsa or sweet potato. Make sure you cut the sweet potato into even cubes so they cook evenly. If you don't have cheddar cheese you could try pepper jack, queso, manchego, gruyere or fontina. You can substitute milk or cream for the half and half. You could also use crumbled cooked sausage or chorizo instead of bacon. Tacos for breakfast?! Don’t mind if I do!!! I love me some tacos. Really LOVE. Any time of day. 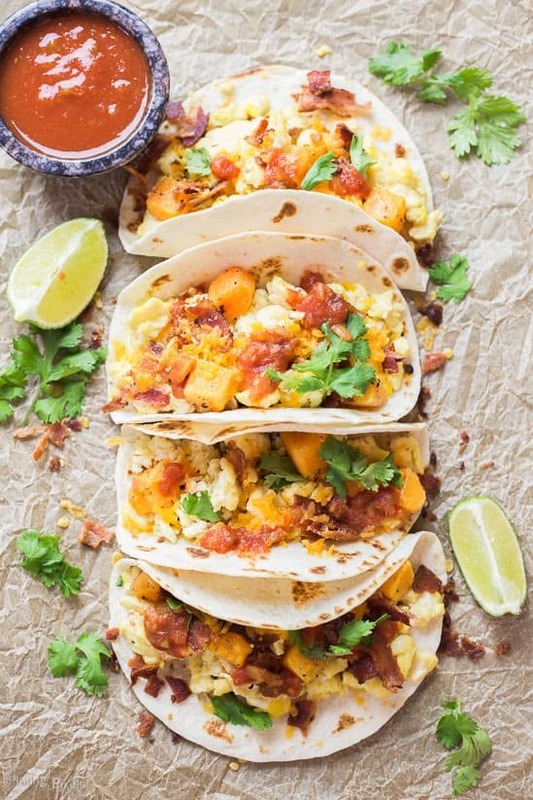 Never made breakfast tacos with sweet potatoes before…perfect for fall! I agree, tacos any time are great Steph! Breakfast is an added bonus. That’s a perfect match then. Thanks Kimberly! Mmmmmmm … I just love Mexican foods for breakfast – huevos rancheros, breakfast burritos – anything like that! So, of course, I was in love with this recipe right from the start! But what’s really special here is the unique and delicious inclusion of those roasted sweet potatoes – what a fantastic idea! Such a great recipe! I’m a fan of anything Mexican. But breakfast is even more unique like you said Shelley. Thanks so much! We made breakfast tacos just like this camping last weekend. They are simply so good! I’ve never made something like this camping but would be such a treat. Would be like gourmet camping. We love a hearty breakfast around here. My husband would love this! That’s the best type of breakfast. Thanks Cynthia! these tacos look so so good! I recently got into sweet potatoes so I’m interested in trying these! If they like sweet potatoes then you’ll like these. Thanks Cymone! They look really hearty and would be the perfect comfort food for a cool Saturday Morning. I’ve been exploring more with sweet potatoes and will try this one soon. They sure are and hope you do get to enjoy them. Thanks Reginia! Glad you like the tips and thanks Kelly! These look amazing. I will have to try them out. I hadn’t till now either but it totally works. Thanks Ros! They are! Thanks for pinning Mandi! This looks so good! I’ve never thought about adding sweet potatoes in my breakfast, but I am definitely going to have to try these! It’s totally works in these. Thanks Kaileigh! These look absolutely delicious! They would also make a good “breakfast for dinner” meal! Breakfast for dinner is one of my favorites! Good point Karin! These look SO good! I hadn’t thought to use sweet potatoes for breakfast, but it makes perfect sense! I love that it adds some extra color (and nutrients) to the dish! Traditional regular potatoes are used in regular breakfast, but these make them fun fall themed. Plus pretty colors like you said. Thanks Brittany!